L' Hermitage Condominum is considerd by many to be Fort Lauderdale Beach's most luxurious high rise condominium. Located on one of the largest Ft Lauderdale Beach front properties L'Hermitage is all about reseort style living. Read more about L' Hermitage. L' Hermitage is located on the Ocean right off A1A, just north of the main Fort Lauderdale beach area. 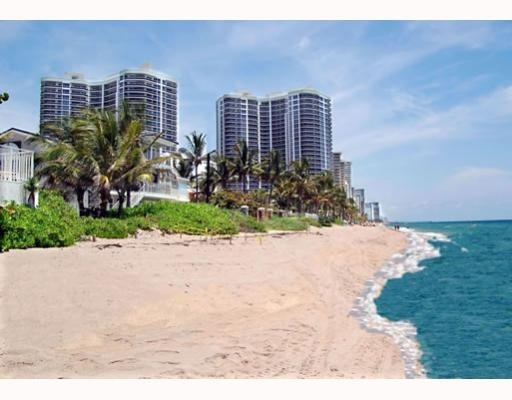 Most Fort Lauderdale Realtors view this is one of the finest of Ft Lauderdale Beach locations. L'Hermitage features views of the ocean, intercoastal waterway and downtown Fort Lauderdale. L' Hermitage has 2 lagoon style pools plus a Childrens Pool. The whirlpool spa, numerous sun decks and the poolside cafe add to the experience of owners and their guests. The lsit of L'Hermitage ammenities go on with private beach cabanas right on the sand, a beautfiul tennis center, barbeque areas, gated guardhouse, valet parking, sports lounge with billards and wide screen TV's and numerous other luxury resort features that make L'Hermitage a standout. Ready to take a stroll to dinner, L'Hermitage is located close to numerous great Ft Lauderdale eateries. Eric Miller and Associates, are always available to help you buy or sell real estate in the Fort Lauderdale Beach area and will be happy to show you L' Hermitage. You can Contact us directly at (954) 383-8170. Just starting your search for a Fort Lauderdale Beach Condo, L'Hermitage is a great place to start, and here are some others.